The 380 km long River Spree drains about 10.000 km² into the rivers Havel and later Elbe. Since the early middle age, the lower Spree was heavily modified to facilitate flood protection, water mills, agricultural land use and inland navigation. The discharge (avg 36 m3/s) was artificially increased by ground water which was pumped into the River Spree during open-cast lignite mining activities in the middle and upper reaches to keep the mining area dry. In response, cross-sections were widened and deepened, banks stabilized and meanders cut-off, later on reservoirs and by-pass canals were constructed. As a consequence, the river lost its natural variability of the flow regime. The absence of flow spates allured intensive agriculture and building of houses and infrastructure in the former floodplain. In the 1990s, the lower River Spree was characterised by eutrophic conditions (0.7-3.4 mg/L total nitrogen and 70-180 g/L total phosphorous), uniform channel form, almost lacking flow dynamics and the corresponding biota, phytoplankton, limnophilic and eurytopic invertebrates and fish. Therefore, the water authorities in cooperation with numerous scientists developed a comprehensive management concept to improve the quality of a 35 km long river section, the so-called Müggelspree. The concept comprised reductions in nutrient loading, re-meandering, raising the riverbed, removal of bank protections, and allowing for flow spates. Figure 1: Re-meandering – the former backwater has been reconnected at both sides and the former main channel blocked by a dam (near the left, upstream opening) (photo: Isabell Hiekel). However, this concept was opposed by a single farmer and very few inhabitants afraid of flood damages. Reluctance of private land owners and political concerns impeded the essential acquisition of adjacent floodplain areas by public authorities. As a result, flood pulses, bank erosion, bedload transport and any other natural, self-sustaining hydromorphological processes apart from the ongoing river bed incision are still lacking today. Finally, four of about 30 backwaters were reconnected between 2004 and 2008. They became the new main stem whereas the former artificial cut-offs were blocked (Figure 1). In this way, the river length increased by about 2.7 km. However, these renewed meanders were completely dredged according to the main channel cross section, artificially wide and rather homogeneous, to ensure the same discharge capacity for flood protection. The former main channel was completely blocked near the opening to force the whole discharge through the new meander and the section up to the downstream end of the new meander remained a static water body. The first two backwaters, reconnected in 2004 and 2005, have been extensively monitored for restoration success between 2005 and 2007. Despite all limitations mentioned, some positive effects of re-meandering were found. The flushed meander provided a much more diverse bed substrate than the former backwater. Habitat heterogeneity had adjusted to the main channel conditions already in August 2006 (Lorenz & Leszinski subm.). An experimental moderate flow spate slightly eroded the outer bank. In the new meanders the flow tolerant macrophyte species dominating the main channel started colonisation with slight delay on the newly dredged bottom substrates (Grünert et al. 2007). The formerly extinct rheophilic thick-shelled river mussel (Unio crassus) had settled and the number of sensitive EPT taxa (benthic invertebrates of the families Ephemeroptera, Plecoptera, Trichoptera) as well as the share of typical riverine species increased (Lorenz & Leszinski subm.). The community structure of fish, macroinvertebrates and aquatic vegetation in the new meanders adjusted to those in the main stem within three years (Grünert et al. 2007, Wolter 2010, Lorenz & Leszinski subm.). However, problems became especially obvious for fish (Figure 2): the simple adjustment to the existing main channel communities will not ecologically improve the river. Sensitive indicator fish species for river health are still declining in both the old main channel and the re-meandered stretches (Wolter 2010). Accordingly, the fish-based assessment score did not improve, because the essential bottlenecks limiting riverine fish species were not addressed by re-meandering as implemented here (Wolter 2010). Figure 2: Observed fish densities in the main channel compared to the rehabilitated new meanders of A) total fish, B) rheophilic fish, and C) lithophilic fish (data from Wolter 2010). All in all, re-meandering of rivers is a common and widely applied river rehabilitation measure. However, if not properly implemented, its effect may stop at the adjustment of a former backwater species community to those of the main channel without further improvement. Ecologically effective re-meandering cannot be static in morphology and statistically neutral in flood risk. In fact, it will always increase the theoretical flood risk by locally narrowing river cross sections. Ecologically successful re-meandering requires allowing for side erosion, depth and width variations as well as channel narrowing to achieve diverse flow patterns, sediment transport and sediment sorting, thereby creating the essential microhabitat patches for typical, sensitive riverine species. 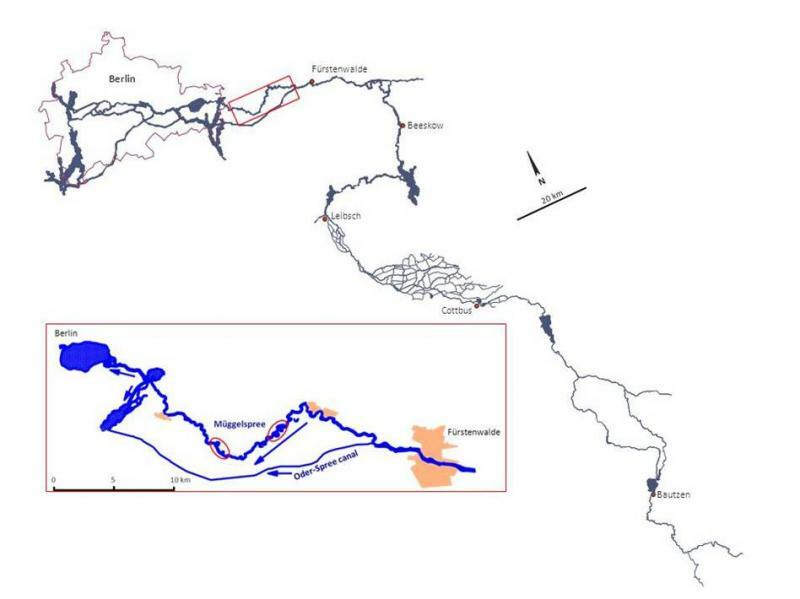 In the frame of the REFORM project, two of the meanders of the Müggelspree are compared with straight sections of the lower Spree regarding hydromorphology, species structure of main groups of organisms, food web interactions and connectivity of river and floodplain. The data has not undergone a final analysis yet, but ultimately the River Spree case study might serve as example for inconsequent and thus inefficient restoration efforts. Figure 3: Map of the River Spree catchment up to its Mouth into the River Havel. The insert shows the stretch “Müggelspree” where the red ellipses indicate the re-meandered sites. Grünert U, Hilt S, Pusch M, Gelbrecht J. 2007. Entwicklungspotential der Makrophytenvegetation in der Unteren Spree nach Renaturierungsmaßnahmen. Naturschutz und Landschaftspflege in Brandenburg 16, 41-47. Lorenz S, Leszinski M. subm. Re-meandering technique determines colonization success of macroinvertebrates in a German lowland river. Hydrobiologia. Wolter C. 2010. Functional vs scenic restoration – challenges to improve fish and fisheries in urban waters. Fisheries Management and Ecology 17, 176-185.